Rain Shuts Yosemite, Threatens Problems at Tallest US Dam - Integration Through Media ....! (VOA): A fierce Northern California storm Friday shut down Yosemite National Park, threatened mudslides in wildfire-ravaged wine country and could present the first test of a partially repaired offshoot of the nation's tallest dam that nearly collapsed last year. 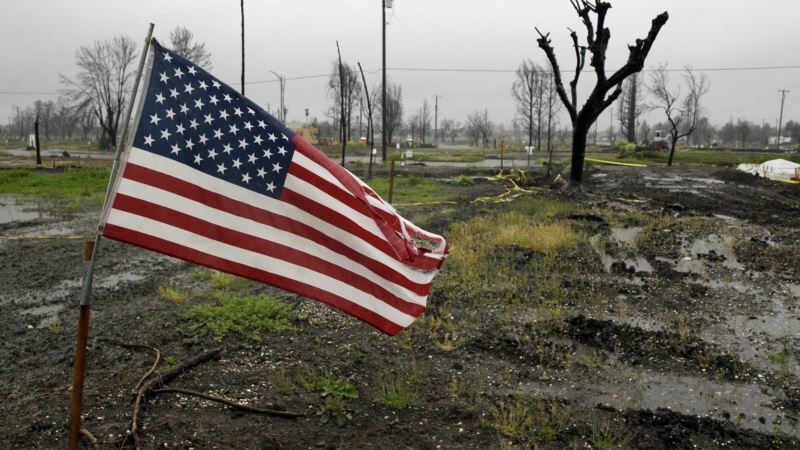 Recent heavy rainfall has led to problems for a state recovering from devastating wildfires, forcing people to flee their homes repeatedly for fear of debris flows tearing down hillsides stripped bare by flames. But the downpours also have provided relief as parts of California plunged back into drought less than a year after a historic dry stretch. Rain was falling throughout much of Northern California on Friday, leading Yosemite National Park to ban all visitors as it expected flooding in its tourist-heavy valley. The opener of the San Francisco Giants-Los Angeles Dodgers weekend series was rained out, the first at the Giants ballpark in 12 years. A couple hundred miles to the northwest, in wine country scorched during October wildfires, the National Weather Service predicted 4 to 6 inches (10 to 15 centimeters) of rainfall through Sunday. The city of Santa Rosa, one of the hardest-hit burn areas, brought in extra firefighters and emergency personnel, fire department spokesman Paul Lowenthal said. It's not the amount of rainfall worrying city officials but the rate at which it falls, he said. Workers have been monitoring hundreds of storm drains, especially those protecting neighborhoods destroyed by fire. "When we start talking about half an inch of rain or more an hour, that's where we're more susceptible to mudslides and debris flow in and around our burn zones,'' Lowenthal said. Flood warnings The weather service issued several flood warnings throughout Northern California ahead of the expected "atmospheric river,'' a long plume of subtropical moisture stretching to areas near Lake Tahoe. Some places in the Santa Cruz Mountains south of San Francisco could see up to 8 inches (20 centimeters) of rain over a three-day period, leading forecasters to warn of possible flooding, mudslides and rockslides. To the north, state officials warned this week that they may have to use the partially rebuilt spillway at Oroville Dam for the first time since repairs began on the badly damaged structure last summer. Behind the dam, Lake Oroville has been filling up all winter, and more water was coming in than flowing out Friday. The water level was last at 793 feet (242 meters) and dropping. If it reaches about 830 feet (253 meters), water managers say, gates to the spillway will be opened. In February 2017, a massive crater opened up in the 3,000-foot (914-meter) concrete chute that releases water from Lake Oroville, California's second-largest reservoir. Crews shut down the spillway for inspections just as a major storm dumped a torrent of rain. The lake quickly filled, and water began flowing over an emergency spillway that had never been used. The water eroded the barren hillside beneath the spillway, leading to fears it would collapse and release a wall of water that could swamp communities downstream. Authorities ordered nearly 200,000 people to flee, but the crisis was averted. California officials say they hope to avoid using the main spillway but are confident it can safely function. News that the spillway may be needed has concerned some people in Oroville, said Genoa Widener, a vocal critic of the water agency. While some of her friends have decided to leave for the weekend to be safe, Widener said she's not concerned the storm will pose a threat. Still, she's frustrated there's even a question about it. "They have the lake rise so much in the last month to try to have some kind of water stored going into the summer,'' she said. "So they've kind of put us in this position again.'' Leroy Mudrick said he's not worried because the water level is much lower than it was before last year's storm. "The lake is still way down,'' Mudrick said.